Apple Stock News: With today's (Wednesday's) announcement that Apple Inc. (Nasdaq: AAPL) has started selling a cheaper model of its iMac desktop, we're seeing a shift in philosophy that would have been impossible under Chief Executive Officer Steve Jobs. 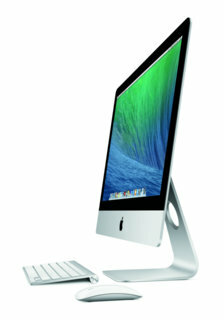 The new 21.5-inch iMac does not replace any existing models, but becomes a new entry-level model. Priced $200 below the previous entry-level iMac, the new model has a much slower processor (the same one used in the MacBook Air laptop), a smaller hard drive, and less capable graphics. Such a product can have but one purpose – to attract customers who can't afford the more powerful models. It's also no accident that this modest iMac has arrived just in time for the back-to-school shopping season. That AAPL is willing to release a product of lesser capabilities in an effort to grow its market is a relatively new phenomenon, something that the iconic Jobs was loathe to do. He feared that selling cheaper versions of Apple's products would hurt the brand's image. But CEO Tim Cook has come to realize since the death of Jobs that offering an affordable option in a given product line just makes sense – and if done carefully won't hurt Apple's image as a premium brand. That's because the larger goal is to bring as many people into the Apple ecosystem as possible, and a cheaper iMac helps achieves that. Apple knows that people who buy one of its products, be it a Mac, an iPhone, or an iPad, are likely to buy others and consequently become customers of the iTunes Store. And this isn't the first time AAPL has come up with a cheaper version of a product line to go after a bigger market. Apple introduced the iPad Mini, a smaller version of the iPad, in late 2012. With a price set $170 below the full-sized iPad, it was designed to appeal to a broader market. And the iPad Mini did indeed prove to be a smart move. In its first year, the iPad Mini accounted for 60% of all iPad sales, though that number declined to about 30% in the December quarter. Jobs hated the idea of a smaller iPad, saying in 2010 that "seven-inch tablets are tweeners, too big to compete with a smartphone and too small to compete with an iPad." Cook also tried the strategy with the iPhone, but with less success. Customers, it turned out, were willing to pay top dollar for the iPhone 5S, preferring it to the lesser iPhone 5C. But Cook is willing to let the customers decide, and that's going to help sales – as well as Apple stock – going forward.